Music From Foggy Hollow comes to you from a 40-plus year -old community radio station, Hawkesbury Radio in Sydney. It's a volunteer-run non-profit association, and one of the first community FM stations to set up in Australia. The station is a strong community-based station - with lots of involvement in the local community. The format of the station is top 40 music from 6am till 7pm, and specialty programmes from 7pm till 6am. That includes Country, Blues, Jazz, Irish and other music, sports shows, motor sport, rugby league etc, and of course more bluegrass than on any other radio station in Australia. 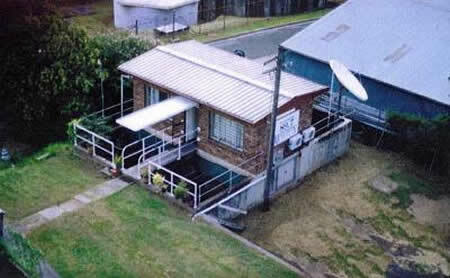 The station runs from sophisticated facilities in what must be the smallest and least-sophisticated building in Windsor, on Sydney's north-west outskirts. The station's listening area covers most of the Sydney's north-west, and we are heard as far north as Gosford, and south almost to Wollongong. And of course worldwide via the streaming service from the station's web site or the Tune-IN app. The show is recorded as it goes to air live in Sydney, and the local news and weather is edited out. Then it is sent over the internet to BluegrassCountry.org in Washington DC in time to be loaded into the stream for the new week's shows. Currently you can hear Music from Foggy Hollow on Sunday mornings at 10am (US Eastern time) , Tuesday at 7pm (US Eastern time) and Friday at 10pm (US Eastern time) The Internet shows are played a week after they air live in Sydney.